One of my longest regrets in rail travel is that I was never able to travel over Stainmore - that lovely, lonely line across the Pennines between Barnard Castle and Kirkby Stephen. 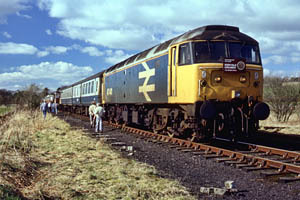 Built as the South Durham and Lancashire Union Railway, the object was to connect the ports of the east and west coasts of the north of England. The basic through route was in fact Darlington to Tebay; the Eden Valley Railway's branch from Kirkby Stephen connected the line into the Cockermouth, Keswick and Penrith at the latter. Hence a pattern of traffic developed in haematite ore from the Barrow area to the east coast iron & steel works, and coke from County Durham to Furness and the Cumbrian Coast. The year after opening the SD&LR and EVR amalgamated with the Stockton and Darlington Railway. Just a year later the bill to amalgamate the S&D and the NER received Royal Assent. The S&D had had a financial interest from the outset - the spindly iron viaducts were designed by that company's engineer, the notorious Thomas Bouch, and were subject to severe weight restrictions for all but the last few years of the line's life. Thus for much of the 20th century, tiny North Eastern 0-6-0s of class "C" (LNER J21) pedalled along with freight and passenger alike. Later, "Mickey Mice" (the BR variant), and eventually 77xxx, 76xxx and Ivatt 4MT 2-6-0s took over the traffic, which could include heavy double-headed passenger trains from the North-East to Blackpool on summer Saturdays. Sadly, the decline in freight traffic and the largely seasonal passenger traffic were insufficient to prevent closure early in 1962. My first journey across Stainmore was thus by road, little over a year later, when the rusted tracks over the 1370ft. summit were a sad reminder of what had once been. I had already seen the summit marker in the (original) York Railway Museum, and had begun to wonder about this remote route. It was about this time I commenced my studies at secondary school, and one of the first characters I encountered there was the new maths teacher, spending a year at the Grammar School before going to lecture at University. Quickly realising there were a number of pupils who were like-minded, he attempted to organise a brakevan trip from Appleby to Kirkby Stephen, on the section of the route retained for stone traffic from Merrygill Quarry. The fare of 15/- quoted by BR unfortunately put most of the potential travellers off, not to mention the journey across the Pennines to Appleby. The line from Warcop to Merrygill closed in 1976, leaving the six-mile link from Appleby as the last fragment of the line, serving the army ranges there. When Hertfordshire Railtours advertised a trip to run from Euston via Crewe to Leeds, thence over the Settle & Carlisle to Appleby, and on to Warcop, I jumped at the chance of a last trip over the Midland route, with at last a chance to realise my long held ambition to travel this isolated stretch of North-Eastern. When the tickets arrived, the erstwhile "Eden Vale Creamer" had become the "Warcop Finale" - closure of the branch was to take effect just after the trip. After 25 years, I had made it with 3 days to spare! I joined the trip at Crewe, in the company of chairman Steve, plus another friend and his wife (who promised to behave). Our train was stuck behind a tardy Glasgow train, so we were about 9 minutes late on departing at 9.31. Our route was most interesting - firstly, electric hauled to Stockport. There, we changed to 47 441, in whose company we travelled for the rest of the tour. Now heading for Leeds, we took the Guide Bridge line, avoiding the latter by taking the Ashton Moss route at Denton Junction. From Ashton Moss we were routed west towards Miles Platting, taking the tightly curved line round the back of the station and out along L&Y metals to Summit Tunnel and Hebden Bridge. Still more interest to follow - instead of heading for Bradford, we left the usual route at Milner Royd Junction to gain the LNWR route at Bradley Junction. We were headed for Leeds, and to avoid reversal there our train ran via Healey Mills and Altofts Junction. From Leeds, the route is of course well trodden. Suffice it to say the weather - torrential rain in Shropshire - had changed to a clear blue sky, the odd white cloud producing those moving patterns on the fellsides of North Yorkshire. S&C at its very best! At Appleby another 47, no. 542, awaited. After a lengthy pause, we drew forward into the "Down & Up Through Siding" - the spur connecting the S&C to the former NER route. The second loco was to "top & tail" the train, and once it was coupled up, we began our trip along the Warcop branch. It was clear that the photographic fraternity knew of the run - a considerable number were out, and given the sunny weather would probably get some good shots, particularly those who photographed our progress across a small stone viaduct, the only feature of civil engineering of any great significance on the short journey. Other points of interest were the remains of the former Appleby East station, and the still lived-in station at Warcop, where our trip terminated, running right up to the buffer stops. Here we had a pause for photography, for those that could leap down onto the ash ballast which was a common feature of many lesser lines. Our return journey followed our outward route as far as Hellifield, after another photo-stop at Ribblehead station. At the former we took the "Lanky Line" to Blackburn, its rails still well polished from the diversions over the weekend. Yet another photo- stop at Blackburn, then on towards Preston, taking the west to south spur at Lostock Hall and thence gaining the WCML for the run back to Crewe, where we arrived, more-or-less on time at 7.30pm., after an excellent day out. A most pleasing epilogue - BR have been told that they may not close the S&C, but must "make a go of it". It seems that the "Lanky Line" is to be retained too - now how about a revival of the regular passenger service on this route, BR? The railtour described above took place shortly after the dreadful detonation of a lorry load of explosives at Peterborough. As a result of that event, the line to Warcop was apparently re-opened a few weeks later - isn't progress wonderful!!! !